At CCS Leeds we are always keen to support local good causes and as you might have seen from recent newspaper coverage we are now offering to host websites for ten West Yorkshire charities for free! 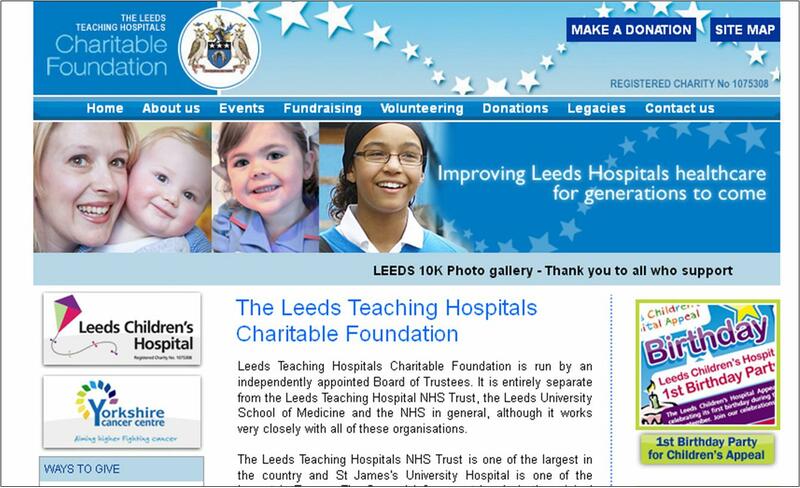 We are already hosting the Leeds Teaching Hospitals Charitable Foundation website for nothing and we are now looking to offer the same free service to a further 10 local charities. Nick Ryder, technical sales manager at CCS, says: "Like most charities the Leeds Teaching Hospitals Charitable Foundation relies on the generosity and support of the general public. We’ve been working with the Foundation for several months now and after finding out more about the amazing work they do, we decided that helping to cut their running costs was the least we could do. "On the back of that, we have decided to offer the same service to other charities too. We would like to invite charities to apply for free web hosting and we will initially choose 10. The charities must be based in West Yorkshire and will have to meet certain criteria, but in the first instance we would like any charities who are interested to get in touch with us and we will take it from there." The Leeds Teaching Hospitals Charitable Foundation is run by a group of independent trustees who manage all the charitable funds raised for the Leeds Teaching Hospitals. The Foundation raises funds for various appeals with the two major appeals at the moment being The Yorkshire Cancer Centre Appeal and the Leeds Children’s Hospital Appeal. Leeds Teaching Hospitals Trust has created a new children’s hospital on the Leeds General Infirmary site which resolves the problem of seriously ill youngsters being transferred across the city for treatment. The Foundation needs to raise money to make every child’s stay as wonderful as possible by providing toys, DVD players, art work for the walls and ‘put up’ beds to enable parents to sleep by the side of their child. This is in addition to the state-of-the-art medical equipment that all staff would like to work with. Any charities who are interested in receiving free web hosting should email nick.ryder@ccsleeds.co.uk or ring 0113 2946699. Which is better, BT Infinity (FTTC) or a Leased Line? In this article I am going to discuss leased lines versus BT Infinity or FTTC and does FTTC even compare with a leased line? The relatively new ‘Infinity’ product from BT is touted as the next generation super-fast broadband service which can deliver download speeds of up to 40Mbp/s and upload speeds of up to 10Mbp/s. The added benefit of this new delivery is that it costs the same as a standard ADSL service which on average is about £30 per month, making it an extremely affordable for a very fast internet connection. As such, many home users and businesses are migrating over to FTTC in order to make use and take advantage of the improved speeds and lower costs. However, as ever with these things that appear to be too good to be true, they often are, and that detail is always found in the small print. To explain, whilst FTTC can indeed offer download speeds of up to 40Mbp/s, there are often data download limits on FTTC contracts which means that whilst you can download data a lot faster, it doesn’t take long to reach the monthly download limit. Once this limit is reached, an ISP will either charge more for over usage or simply throttle the connection down to a much slower speed. In some ways it’s a bit like owning a car which has a top speed of 200Mph but UK speeds limits dictate that anything above 70Mph is breaking the law. The faster is it, the more you use and the more you use, the more you pay. ADSL and FTTC are all technologies that are delivered to homes and businesses on copper pairs of wires. It is an efficient way of doing things as there are more often than not, copper pairs are already connected to premises as this is how telephone lines are delivered. However, in some cases copper is not always used and instead, aluminium wire form part of the delivery to site. If this is the case then any guaranteed speeds which are promised for FTTC often go out of the window. This was highlighted in a recent case whereby a home user ordered an upgrade to FTTC from his current ISP as it had been announced that it was now available at his exchange, and that his line qualifies for an estimated download speed of 35Mbp/s. What followed was a comedy of errors with the customer achieving nowhere near the promised ‘up to’ speeds of 35Mbp/s and instead a very unreliable 15Mbp/s which was prone to drop outs on a regular occasion. It finally came to light that the reason for the poor performance was that part of the copper delivery was indeed on aluminium wire. Open Reach (who is responsible for that part of the network) could only respond by saying that it was essentially ‘tough luck’, as it was not economically viable to replace the aluminium with copper. How much aluminium is out there? Is aluminium still being laid? If Open Reach were not prepared to replace / upgrade the aluminium as outlined above then is this their default stance in cases where buried aluminium cable is seriously affecting the performance of FTTC deliveries? In any event it is our opinion that FTTC / Infinity can be an excellent product but it does still have its flaws and should in no way be considered as a viable alternative to a fibre based leased line. FTTC still does not come with any sensible SLA or guaranteed fix time. Leased lines do, and many businesses simply cannot survive with extended periods of internet down time. Additionally leased lines are not subject to any kind of contention, download limits, bandwidth throttling or traffic shaping. I hope that this article sheds some further light on FTTC and that it has been informative. We do welcome your comments on this article and indeed any others. At last Leeds and Bradford are to get ultra-fast broadband. Like many ISPs in the Yorkshire region we have been pushing for this for some time. So the announcement by Chancellor George Osborne that ultra fast broadband and wi-fi is to be funded in Leeds, Bradford, Belfast, Birmingham, Bristol, Cardiff, Edinburgh, London, Manchester and Newcastle is to be welcomed. Leeds and Bradford submitted a joint bid for funding through the Urban Broadband Fund as part of the Leeds City Region Partnership's plans to support economic growth and job creation. The announcement includes government funding for the two cities of up to £15m to support projects which include rolling-out ultra-fast broadband access to more than 16,000 businesses, and to develop full wireless coverage within both city centres and along key transport corridors into and between both cities. Leeds City Council leader councillor Keith Wakefield, said: "I am very pleased that we have been successful in our joint bid to become one of the first super connected cities. This funding will enable us to accelerate the transformation of our cities, putting in place digital connections amongst the best in Europe. "This will be a major attraction to business and will help in attracting further investment to both cities to support our economic growth ambitions." These sentiments very much echo our own. Leeds is already a significant IT and e-commerce area and has a growing number of businesses with special expertise in the video games and animations sectors. Making central government funding available for next-generation broadband can only enhance the city’s offer, and will attract more IT companies to the city. The popular gaming console, the XBOX 360 is getting whole new series of updates due for the XBOX Live service it has been announced recently. All of these new updates are video streaming services which use the internet to display video content on your television set. Of the new internet channels, there are popular UK catch up services such as the BBC iPlayer, 4oD, and Demand 5. Additionally YouTube, msn video, Dailymotion and Crackle provide additional video content whilst Muzu.TV and Vevo offer music related video performances. Finally and perhaps more exciting news is that Netflix and LoveFilm are also available as part of the new service. You can read our review of Netflix here. This all goes to prove that the way we are keeping ourselves entertained in our own homes is rapidly changing, improving and evolving with the advent of faster and more reliable internet connection. You can read a more in depth article about this here. As a leading Internet Service Provider, CCS (Leeds) Ltd like to stay ahead of what is happening in the world of technology and we would be more than happy to offer free advice when it comes to choosing the right internet connection for your home or business. Why not have a look at our website for more information or give us a call on 0113 2946699? At CCS we like to think we can ensure all lines of communication remain open - and we just have. During the filming of a popular ITV detective drama series in Yorkshire we installed a temporary VoIP (Voice over the Internet Protocol) telephone system for the production crew of the DCI Banks series. Left Bank Pictures is currently filming the second series of the detective drama, starring Stephen Tompkinson and Andrea Lowe, which is based on the series of books by Peter Robinson and set in Leeds and neighbouring towns and cities. We carried out the work at the production team’s base in Burley Road, Leeds, in time for the start of filming later this month. Jo Healy, assistant co-ordinator at Left Bank Pictures, tells us: "We’re working in Yorkshire for just four months but obviously we need internet access and telephones throughout our time here. The fact that we are only located here for a short period of time often causes problems with large communications providers as they require a minimum term contract – often 12 months – which is just not suitable for us. "CCS came on recommendation and they have listened to our needs and installed a system which ticks all the boxes. They had us up and running very quickly and the service is excellent value - as you can imagine we make dozens of telephone calls a day, mostly to mobiles, which can soon add up in costs." While the actual technology and installation work was not out of the ordinary for us, the project is somewhat unusual - it is the first time we have kitted out an office for a film crew. It is nice to think that we have helped bring the production together, albeit more as an ‘extra’ than a starring role. I have to admit I hadn’t seen the programme before but I think I will enjoy watching the next series when it airs later this year. I remember a time years ago when my dad arrived home one night with our very first video recorder. As a 7 year old it must have been one of the single most exciting things to happen in our house in my life. We could actually record programs and films, from the TV, and we could watch them later, and as many times as we liked. We could rent films from the local video library and the player itself even had a remote control (which was on the end of a long wire which had to be plugged in to work). It was thrilling at the time as suddenly we weren’t restricted to watching what was in the TV or Radio times, a whole new world of entertainment had now opened up to us. In our house, video really did kill the radio star. Fast forward a few years and along came the DVD player. At first this was a very expensive device but the improvement in quality over VHS was tremendous. You could even hack most devices so that they would play foreign DVD’s which again, opened up even more content and availability. The advent of CD and DVD burners some years later also meant that video files kept on a computer hard drive could be burnt onto a blank disk and then played on the DVD player itself. The advent of faster internet connections brought the ability to actually download movies which again, could be burnt onto disk in a number of supported DVD formats, such as VCD, SVCD or full DVD copies. Some DVD players could even play raw video footage without the need to convert then which was often a laborious and time consuming affair. Now, one of the greatest and possibly the worst leaps forward in home entertainment (certainly in my opinion anyway) was the ability to stream films and music from a hard drive or computer, to a television set using a hardware media streamer. What this means is that a person can convert all of their DVD disks, store them on a hard drive and then access them over the home computer network. Good you may think. Lots of space to be saved and no misplacing disks or getting them mixed up any more…. Well indeed, there is that. But, this creates a new problem by making the whole process far too easy. What I mean is that with Video cassettes and DVD’s, you had to physically pick what you wanted to watch, take it out of the box, put it in the player, sit down and then enjoy the film. But now, everything is available as part on an on screen menu system and there is often far too much choice. There have been many occasions where I have spent ½ hour flicking through all the many choices of what to watch only to press play and then 15 minutes into the film decide that no, I’m not really in the mood for this particular thing after all and then promptly spend another ½ flicking through the rest of my choices. Before you know it another evening has passed by. Whereas, if it had been a DVD, then it would have stayed on, and I would have watched the film to its conclusion, especially if I had rented it from a local store. We now have online streaming services such as Netflix, the Apple Store and Love Film. All of these services are fantastic as they offer so much choice from their cloud based libraries but the same problem exists. Is there too much choice? Well, it seems that the answer is probably a resounding ‘yes’ and things are only going to continue in this manner. I can see a time when all homes will have television connected to the internet and therefore the cloud. Physical copies of films and music albums will no longer exist and I think it will happen a lot sooner than we think. How do we cope with all of this additional choice? We change, just as we always do. New just in: research from Imperial College has found Local Loop Unbundling does not increase broadband penetration in residential areas. Broadband penetration in residential areas may not be increased by Local Loop Unbundling (LLU), according to research carried out by Imperial College in London on behalf of British regulatory body Ofcom. LLU is the process whereby the incumbent operators in an area, such as BT and Kingston in the UK, make their network available to other companies, which then install their own equipment in the local telephone exchange. A report by ComputerWorld claimed that it was introduced to encourage competition in the broadband market and prevent it being monopolised by any one provider, something which it was hoped would increase both the quality of service being provided and the extent to which high-speed internet access would penetrate residential areas of Britain. However, research being carried out on behalf of Ofcom by Professor Tommaso Valletti, using the regulator's datasets, has revealed that LLU appears to decrease broadband penetration. He suggests that this overall demographic shift may be down to the increase in computer literacy seen across the UK over the last decade, rather than being linked to the use of LLU in increasing broadband access. The professor explained that in areas with an LLU network broadband penetration was two per cent less overall, something which he suggested could be due to broadband providers withdrawing cheaper services and installing higher-quality ones because of the flexibility offered by the new infrastructure. Promotion: During the whole of March CCS Leeds will be providing free leased line installations* for all new and existing quotations for leased lines, regardless of when the quotations were provided. In addition to this we will be providing a reduction in hardware costs to make the up-front costs of a leased line as low as possible. High installation costs can often put people off ordering a leased line, even though it is often the right decision to make, many feel that £2k and upwards is just too much to commit to. Therefore we have negotiated with our channel partners and come up with some new packages which means that we can now offer free installation* and lower cost leased line rentals. Anyone who has received a quotation from us in the last 6 months, or even further back should get in touch so that we can provide you with an up to date quotation based on this months special offers. As an example, we can offer a 100Mbp/s Leased Line to an address with the post code starting EC1N, in central London for £600 per month with FREE installation. This would be a wires only unmanaged service but we could supply some Cisco hardware for £449 which will enable us to manage the service free of charge. If the month of March proves to be a succes then we may look at extending the offer into April. *Subject to carrier availability and full site survey. Offer only available until 31st March 2012. There is still much misunderstanding about cloud computing and its delivery and what most people forget is that somewhere your data or software is sat on a secure server rather than one in your office or even your head office. In basic terms cloud computing is the delivery of computing as a service rather than a product, so shared resources, software, and information are provided to computers and other devices as a metered service over the internet. However, people looking to go into the cloud need to understand that there are limits – it’s great for small enterprises but you might have to acquire a number of servers or other computing equipment. It’s a bit like the electricity grid where the end-users consume power without needing to understand the component devices or infrastructure required to provide the service. The past few years have seen cloud computing increasingly accepted as a form of service delivery. From the user’s point of view it provides services ‘on-tap’ and enables a nimbleness in business operations. Given the current economic climate, cloud adoption is set to increase because it requires less capital and operational expenditure certainly for smaller companies and it’s a service we have been offering for some time for clients who just want to access their data via the internet. We expect there also to be a growth in complete cloud desktop offerings too, which comprise all the services, and bespoke apps, that smaller companies use. At the enterprise level, the continued transition to private clouds will gather pace. Automation and orchestration will become central as private cloud infrastructures are built out and the need to manage the use of internal cloud infrastructures and balance usage of external services becomes increasingly important. The next big thing could be mobile cloud computing but mobile bandwidth remains very limiting some mobile phone providers have in place data caps and excess usage charges which will make it expensive. This also ties in with data storage questions that organisations will have to answer. If anything, the cloud is driving the availability of a growing mass of unstructured data especially from social networks and emails. Data management solutions are available to deal with these issues; the important thing for companies is defining what they want to do with the data, what is accessible and what it not.